This highly transparent burnt orange loves to mingle with lamp black, settling in beneath it, mixing with it to create tones of cinnamon and tobacco. Fire seems to dance on the walls as its peach undertones nestle in with the black. Incredibly warm and non-staining, you can create stunning effects. 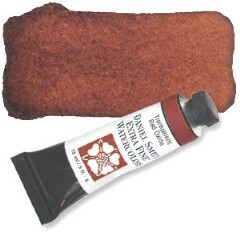 Glaze Transparent Red Oxide over French Ochre for a warm fireside glow or layer it over itself for a rich and glowing red ochre which has no equal.